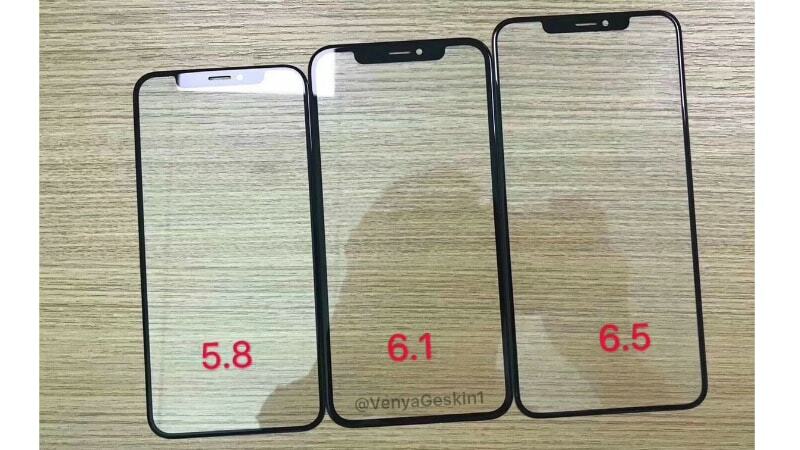 While much about the 2018 iPhone family has already been leaked, an image showing the glass panels of all the three upcoming iPhone models have now emerged to help us see how thin bezels the new offerings will feature. The glass panels surfaced online reiterate the display sizes of the new models that are rumoured to come in 5.8-inch, 6.1-inch, and 6.5-inch variants. These also highlight the presence of a display notch of the new models. 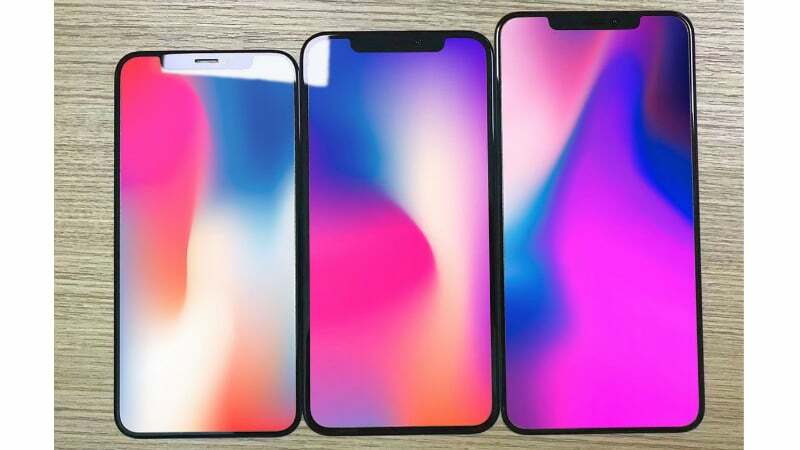 Additionally, an image showing the display of the three new iPhone versions suggests the 6.1-inch LCD iPhone model will have thicker bezels against the two OLED models. The LCD model is already rumoured to have an as cheap price as $600-700 (roughly between Rs. 41,000 and Rs. 48,000). Tipster Ben Geskin on Tuesday leaked the image showing the glass front panels of the 2018 iPhone lineup that is speculated to include the 6.5-inch OLED display featuring iPhone X Plus, 6.1-inch LCD iPhone, and the 5.8-inch iPhone X successor. The glass panels apparently confirm that new models will look similar to the iPhone X - at least from the front. Further, it is safe to say that even the LCD variant this year will have thin bezels. It is indeed worth noting here that there is a minimal increase in the thickness of the 6.1-inch glass panel. This is vital as LCD panels aren't as advanced as OLED panels, and thus they require some black space across their four sides to produce images. Nonetheless, some previous reports have claimed that Apple is in talks with LG to deploy its MLCD+ panel on the upcoming 6.1-inch iPhone model. The same display panel debuted on the LG G7 ThinQ earlier this year. Prolific analyst Ming-Chi Kuo separately highlighted that due to the LCD, the lower-end iPhone model will come with a price tag between $600-700. This is less than the $1,000 iPhone X, though the new model will offer a similar design. Geskin in a separate tweet posted an image showing the display panel of the 2018 iPhone family. The 5.8-inch OLED model certainly appears as the most compact option, the 6.1-inch LCD model and the 6.5-inch OLED model are also likely to have a design that fits easily in one hand. Previous reports have claimed that the 2018 iPhone lineup will come bundled with 18W fast charging-supported USB-C accessories and dual camera setup. Apple could also offer its Face ID feature that recognises facial features using the TrueDepth Camera system to unlock the screen. Moreover, it is clear that the new models will run iOS 12 out of the box since the Tim Cook-led army released the new operating system at WWDC 2018 last month. PS5 and Next Xbox: Will Single-Player Offline Games Survive?